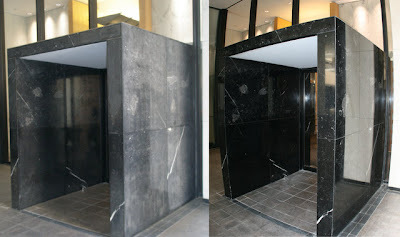 We perform a variety of natural stone cleaning services for both interior and exterior architectural surfaces. Our natural stone restoration services include the proper mix of high pressure and chemical in order to effectively restore the natural stone surface to it's intended appearance. After the natural stone restoration process, we recommend applying a protective treatment to the stone in order to protect it from future staining. Various types of sealers can help to enhance the natural stone surface after the sealing process for an enhanced appearance. We can also apply clear sealers after the natural stone restoration service. In addition, we recommend performing scheduled natural stone maintenance in order to properly clean natural stone. Natural stone maintenance is affordable with our natural stone maintenance company procedures and protocol. Our experience makes us the natural stone restoration contractor of choice for many top level property management companies.